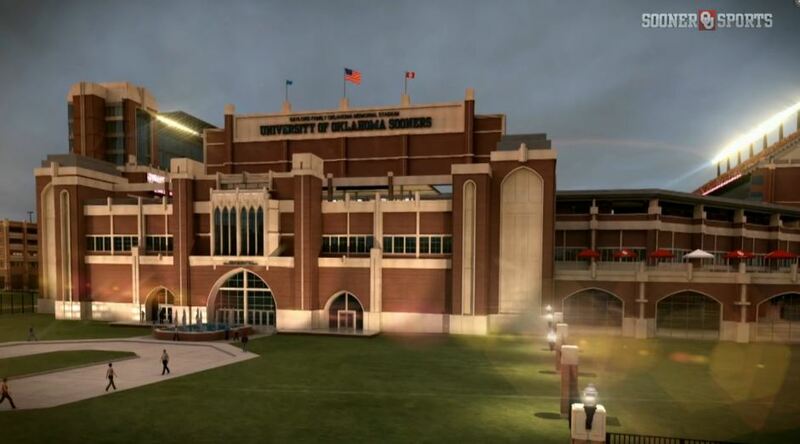 The University of Oklahoma Board of Regents approved a proposal from OU Athletics on Wednesday to proceed with the development of plans and projects for a major renovation and modernization of Gaylord Family – Oklahoma Memorial Stadium. 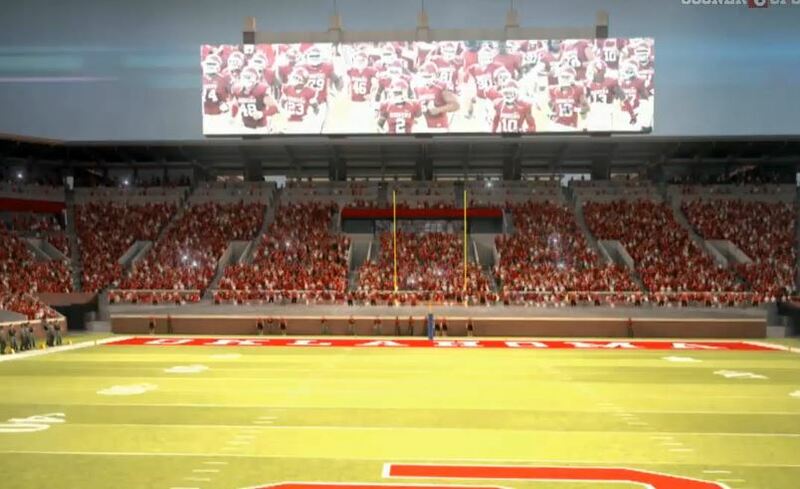 Among other changes, the south end zone will be enclosed to form a continuous bowl. This commitment strengthens the resolve of the University of Oklahoma to remain competitive with fellow universities, while developing facilities to assist in the recruitment of outstanding individuals to the University as OU seeks to provide the best possible experience for its fans and student-athletes. 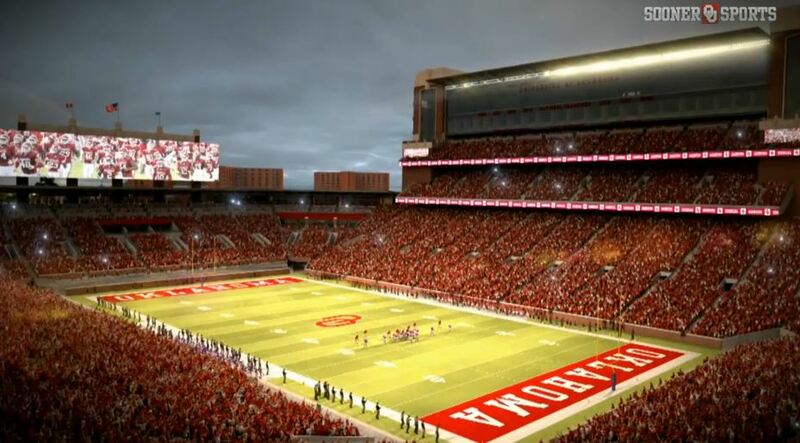 The goal is not to expand the seating capacity, but to better meet the needs of fans and student-athletes. This updated stadium master plan project development will be subject to ongoing review and approval by the OU Board of Regents. The conceptual master plan outlines numerous amenities and upgrades that will enhance the fan environment on all seating levels. 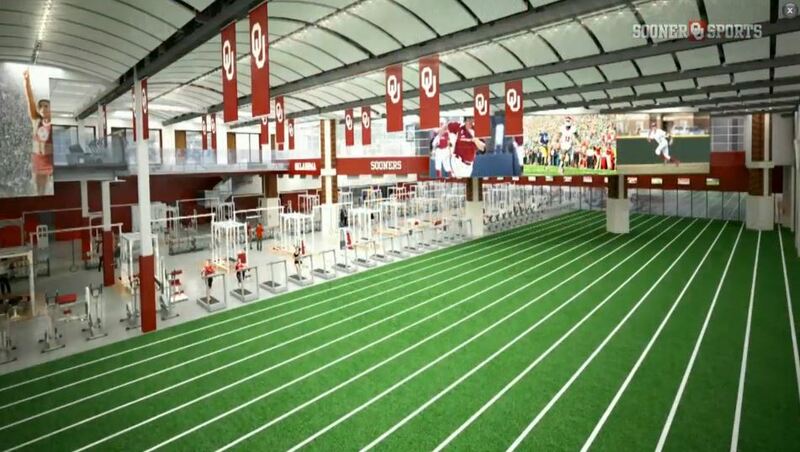 In addition, numerous areas utilized within the facility by Oklahoma student-athletes will be decidedly expanded or renovated. The estimated cost of this proposed project is $370 million. No state-appropriated funds and no funds from student tuition will be used. In addition to bonds, a significant part of the project will be funded by private fundraising. 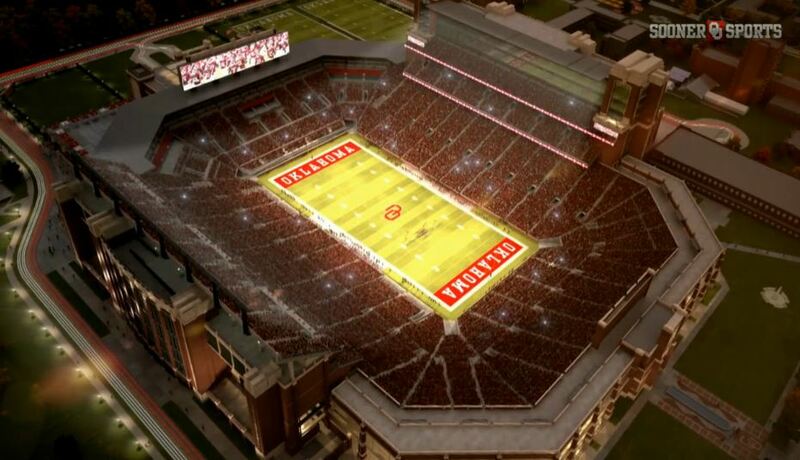 Current conceptual renderings depict a seating bowl that will surround Owen Field as the south end zone becomes fully connected to the east and west stands. 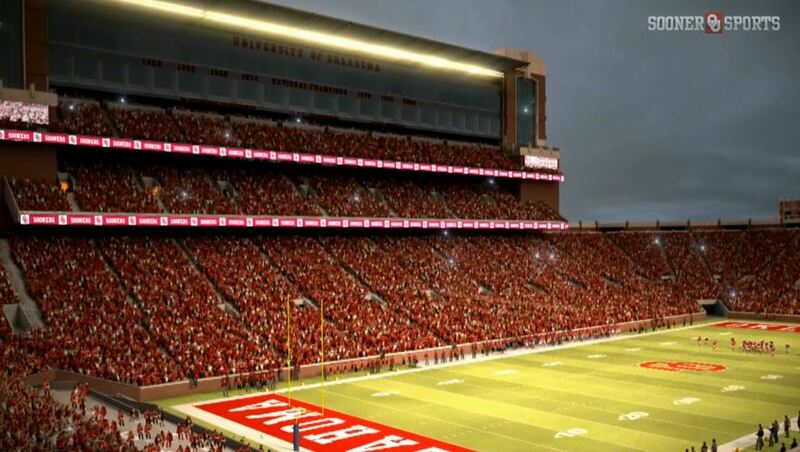 Although the capacity of the facility is not anticipated to change significantly, various new seating options will be available for Oklahoma fans and ADA accommodations will increase, as well. Restroom facilities are projected to increase by 43 locations, while 69 additional points of sale for concessions will be constructed. 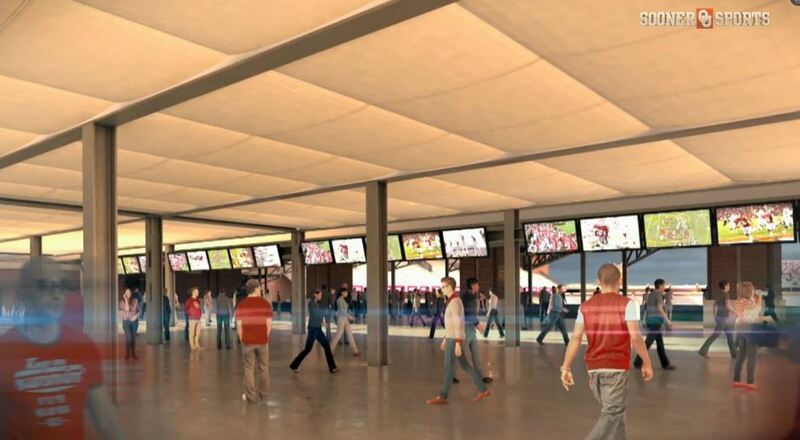 These improvements are among the many accoutrements designed to increase fan satisfaction, add convenience and improve overall game day enjoyment for all University of Oklahoma fans. An increase in the square footage of the stadium’s south end zone will feature an expansive 46,000-square foot fan plaza and a covered upper concourse. A major redevelopment of the Barry Switzer Center will also result in nearly 50,000 square feet of new space for student-athletes. Weight room facilities are slated to be enlarged, resulting in a year-round high-performance training, conditioning and speed enhancement center measuring 30,852 square feet. 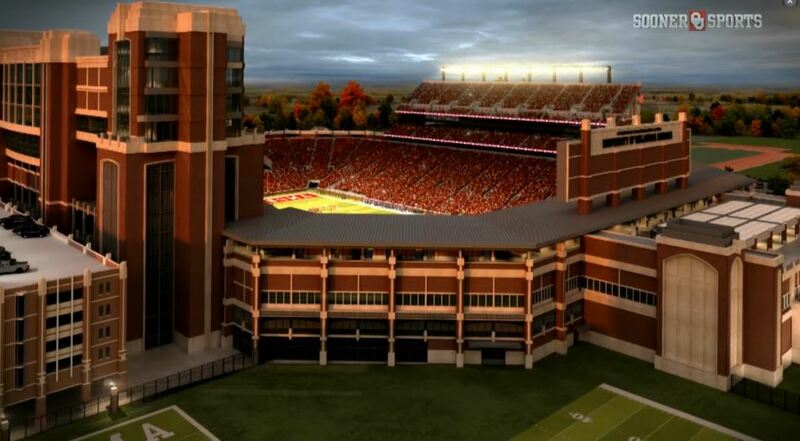 Escalators are proposed for installation at Gaylord Family – Oklahoma Memorial Stadium as 16 moving stairways and 18 new elevators will expedite fan movement. Chair-back seating options, expanded concourses and fan cooling rooms are also areas addressed in this major renovation and modernization project. A new west stadium concourse will nearly double the existing fan space in that area, while media, broadcast and game operations areas on the west side of the facility will be completely reconstructed, adding more than 32,000 square feet to those areas that will be equipped with the latest technology. Recommendations made to the OU Board of Regents also include approximately 60,000 square feet of University academic space to be housed inside the north end of the stadium. This repurposed space would be realized when administration offices for OU Athletics are relocated to a new wing of the south end zone. The augmentation of the current football operations area will also feature the addition of 11 football position meeting rooms, as well as state-of-the-art medical training, equipment and football operations facilities, in addition to new coaching offices and meeting space. Updated finishes and other treatments will be added to locker rooms and other student-athlete areas. 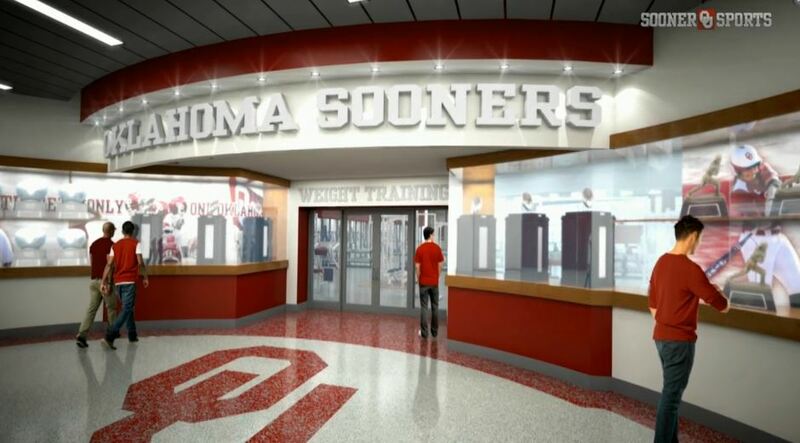 A new main entrance to the OU Athletics administrative offices and a distinctive glass and brick façade will showcase a new south exterior of Gaylord Family – Oklahoma Memorial Stadium. This signature addition to OU’s iconic home field will face Lindsey Street as the facility further embraces the traditional Cherokee Gothic architectural motif exemplified in other structures across the University of Oklahoma campus. 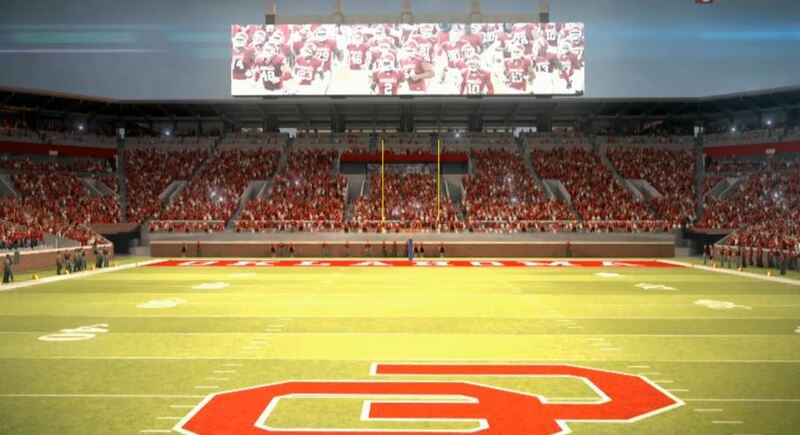 The south end zone structure will be topped by a new 8,750-square foot video board for SoonerVision to display more replays, stats and other in-game multi-media entertainment than its current counterpart.